Crowdsourcing, collaboration, co-creation – there’s a lot of interest in how to involve more people in creative processes. 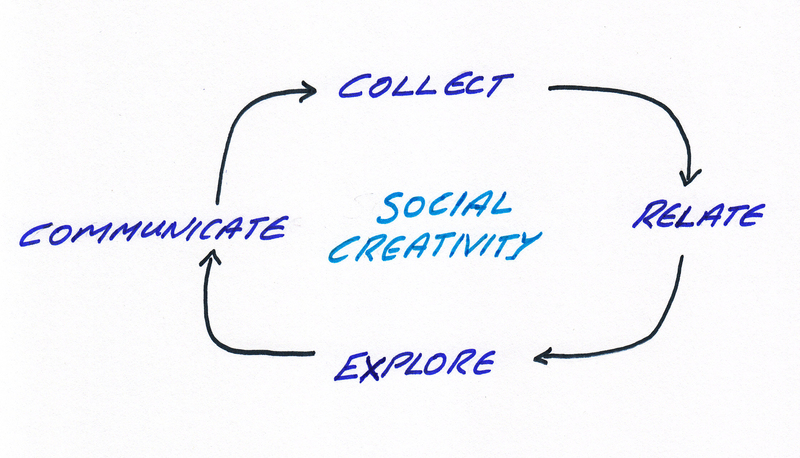 It is often referred to as ‘social creativity’. But do we really understand how to combine people, technology and creativity to generate new solutions? There are numerous technology solutions that could be used for each stage. To be successful it’s important to use the technology effectively. Let me suggest what should happen at each stage, then suggest technology that could achieve the desired result. 1. Collect – Here we are aiming to collect information that will provide insights into current activities, the current challenges and emerging trends in the area of interest. We need technology to collect information from a wide range of sources and present it to the team. Technology options include: mining twitter, blogs etc; using search engines or professional researchers; collecting customer opinions via the website. It’s important to choose ones that are appropriate to the area of interest and what we want to achieve. 2. Relate – Put information in front of the team so they can look for trends and opportunities. They need to share and discuss the information to ‘make sense of it’. Data mining and visualisation software, internal instant messaging, blogs, wikis can all be used. However, we don’t want to drown staff in a tidal wave of information that’s difficult to understand and interpret. So it’s important to provide some structure. Set up areas, themes or tags so people can filter the information and look at what is important to them and the organisation. Better still, allow them to classify the information themselves and share it with others. 3. Explore – Allow people to look at the information and discuss emerging topics. Again, internal micro blogs, blogs, wikis, and information management systems can all be used. It’s how they are used that makes the difference. Make them accessible, encourage people to share their insights and develop them into solutions to problems or novel opportunities. Enable the team to start discussions on topics that they see emerging from the data or they think are important. Encourage an interdisciplinary approach. What are the sales staff finding that they should share with marketing or manufacturing? How can they use this to improve what we already do or to create new products or services? 4. Communicate – Now we have insights into our environment, its challenges and trends. We have some ideas for solutions, opportunities or innovations. Great. Don’t loose them. Don’t let them sit in some digital repository or the minds of only a few people. Use them. Share them. Act on them. We need a mechanism for turning these nascent opportunities into action. If it is a small organisation perhaps pointing all the staff at the proposals will be enough. If it is a larger organisation perhaps we need an informal inter-disciplinary group responsible for brining good ideas forward. If it is a very large organisation perhaps dedicated staff charged with developing innovation projects are an appropriate way to socialise the information. Either way, don’t waste those ideas and insights. Turn them into something special. To realise the benefits of this work we must follow through on some of the opportunities. Furthermore, if we don’t follow through we may disillusion our staff. They need to see an outcome to maintain their interest in innovation. Following through on some of the ideas, and showing people we are following through, will help create a culture of innovation in the organisation. The intranet is ideal for communicating how an organisation is innovating. If you have experience of combining people, technology and creativity to come up with new solutions to business and social problems I’d love to hear from you. This entry was posted in Collaboration, Creativity and tagged collect, communicate, creativity, explore, innovation, people, relate, social, technology. Bookmark the permalink.